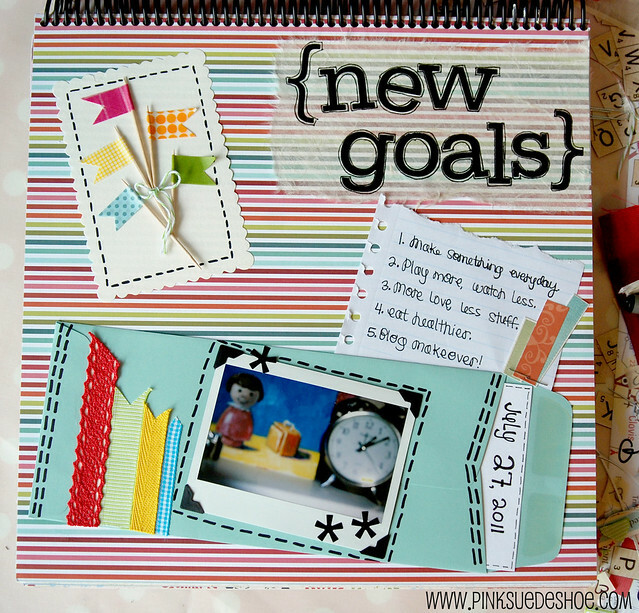 Today’s art journal page is about some new goals I set for myself. When I was growing up I never wrote in a journal, or a diary unless my mom made me. So that means I have very little to look back on and remember what I was like. I started keeping my own scrapbooks in junior high, but everything before then can be summed up in a few sentences on mostly empty pages of my journal. At the beginning of the year I made a goal to write more. Everyday. But when Creamie and I were both sick for 4 months at the beginning of the year, that goal got pushed aside for things that were more important. Like snuggling with my sick baby. I’m trying to get back in the habit of writing everyday. I am still working up to it. It will probably take a few more months before I am back to not skipping a single day. 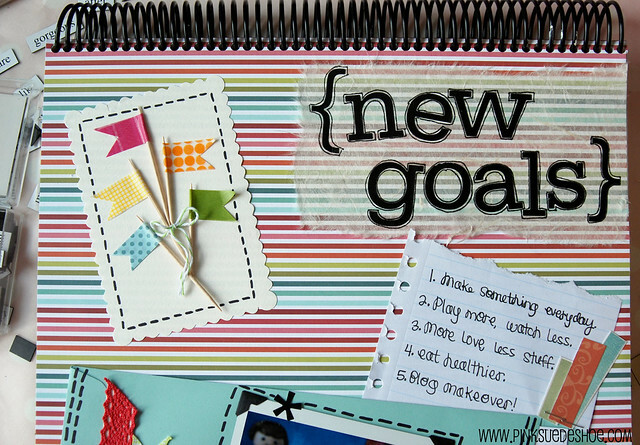 My new goals for right now, just a regular old Wednesday in July are hopefully the kind that I don’t fall out of the habit of working on. No matter what happens, I hope that I can stick to these few things. Because they are important. 1: Make Something Everyday (even if it’s just dinner). 2: Play more, Watch less. 3: More love, Less stuff. 4: Eat healthier. 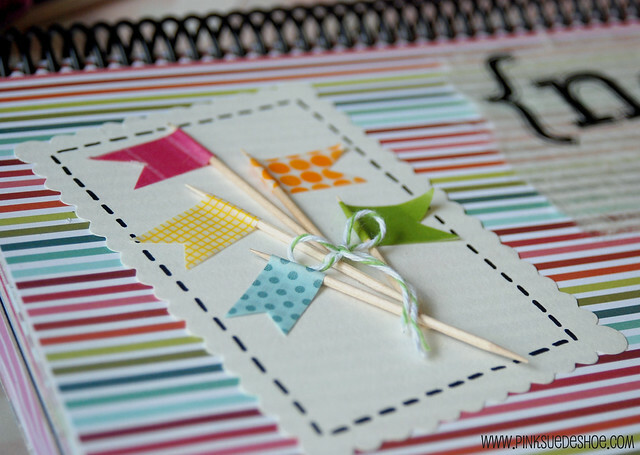 5: Blog Makeover. See, they are important. Well, except for the last one. A blog makeover isn’t really important in the whole huge scheme of things. But it’s about time… this blog has looked the same for a long long time and I think I’m ready for a change. It’s going to be my reward for improving on the other four. So I hope it is soon. Soonish. And just so you can all see that I am a real person who makes a lot of very real messes, this is what my desk looked like after 2.5 pages in my art journal. Monday afternoon before I started it was completely clean. And boring. Now it is much more fun. I do have like 6 Sharpie markers, and only one of them has a clean sharp tip… I really should put the other 5 somewhere else, because whenever I need that marker I end up opening up 3 or 4 before I find that nice new tip. Will I actually do it… probably not. I hope your Wednesday is lovely. I am going to get my hair turned from peachy-not-very-pink-anymore back to blonde this afternoon. It’s time. 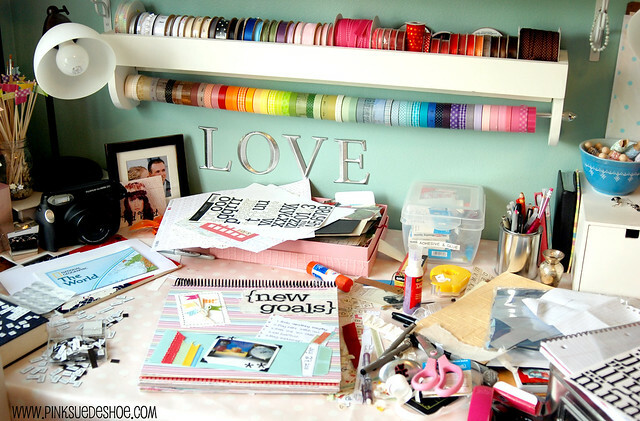 So, so love this, and loved seeing your desk too! inspiring. i am the same way with journaling. good luck my friend. can’t wait to see your golden locks.